The new Apple Mac Pro was already a distinctive looking computer in its regular, stealthy black colour. As you can see in the images accompanying this story, it screams “Hey, look at me!” in red. (Product) Red that is. 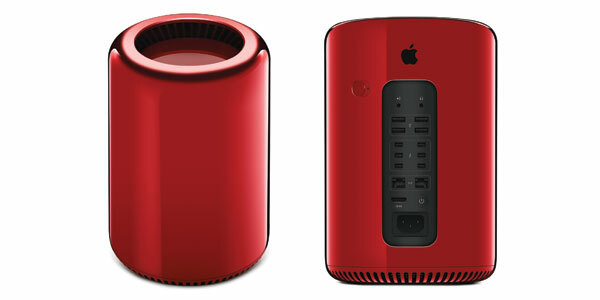 This limited edition (Product) Red Mac Pro has been designed by Apple’s design head honcho Jony Ive, along with Australian industrial designer Marc Newson. This is the same team that recently collaborated on a limited edition Leica camera. This red Mac Pro is a one-off, so when we say limited edition we mean LIMITED EDITION! (Product) Red is an an initiative formed to work with brands to create products with a red colour theme, in order to raise funds for the elimination of HIV/AIDS in Africa, plus raise money for the Global Fund to Fight AIDS, Tuberculosis and Malaria. Apple has previously released (Product) Red version of iPods, iTunes cards, and iPad covers. This 1 of 1 red Mac Pro computer will be auctioned by Sothebys on 23 November 2013, at 7pm local time. Sothebys has listed the estimated price as USD40,000 to 60,000. If you’re cashed up and feeling philanthropical, you can register to bid for the (Product) Red Apple Mac Pro at the page for Lot 27 of the Jony and Marc’s (RED) Auction at Sothebys. Other items on offer are one of the aforementioned Leica Digital Rangefinder Camera, Steinway & Sons Parlor Grand Piano and a 2012 Range Rover, all customised by the Jony Ive and Marc Newson team, plus Apple EarPods in solid rose gold, a Russian cosmonaut suit, a pair of Damien Hirst ‘Spin Chairs’ designed by Jasper Morrison, and a custom Jaeger-LeCoultre Atmos “561” Clock. In the video below, Jony Ive and Marc Newson discuss the work that went into the one-off designs in this collection. 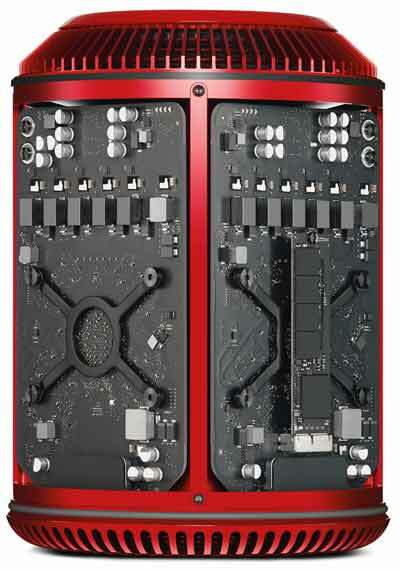 Inside view of the Apple Mac Pro 2013 (Product) Red edition. Next ArticleMotorola Project Ara – is the component phone idea about to get real?